The day was cold and blustery but the prospects for Dorchester’s Malibu Bay become noticeably brighter with the placement of a test population of 200 oysters. 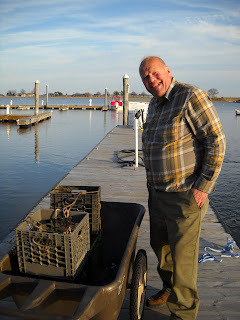 The oysters were part of the population purchased from our friends and supporters at Island Creek Oysters of Duxbury. 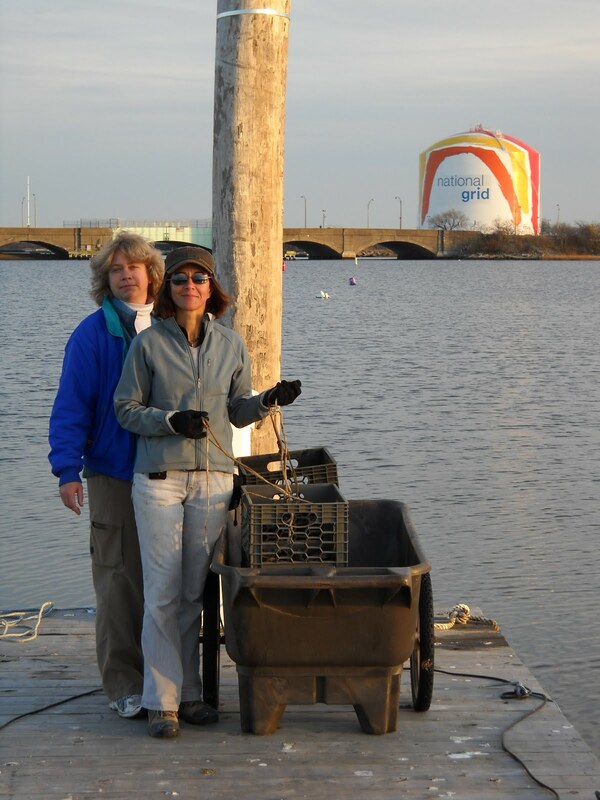 They were placed in milk crate cages off of the docks at Dorchester Yacht Club Dorchester Yacht Club in conjunction with faculty and students at UMass Boston. The red flag indicating unsafe water quality is an unwelcome sign at Malibu beach, occurring with greater frequency than anyone would like. A large part of the problem is Combined Sewer Overflows (CSO’s) that release minimally treated waste water into the harbor during periods of heavy rains. UMass Boston Professor Anamarija Frankic who runs the Green Boston Harbor Project reached out to contacts at Dorchester Yacht Club (DYC) who are interested in improving the state of the Harbor. Caring for the water is important to the Club who maintains a pump-out facility to ensure no waste from the boats enters the Harbor. There is deep soft silt in the Bay so a permanent placement of oysters would need to be carefully orchestrated to ensure that the mollusks are placed on a firm surface where they would not be smothered. We will measure them; tracking their growth and mortality, while also monitoring water conditions including temperature. These oysters are only an inch long, so we expect some mortality this winter as their lower body mass makes them susceptible to death from hypothermia. But just as acorns grow to mighty oaks, this project could lead to bigger things. For MOP this is significant for several reasons. 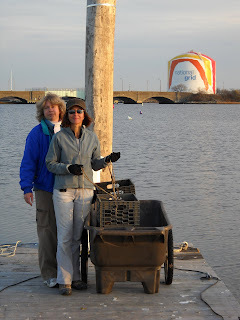 This is our first placement outside the Charles Estuary. We are involving other neighborhoods and groups in our effort to clean Boston Harbor. We will obtain additional valuable data.